شفاعتی, مصطفی, بروجردیان, امین میرزا. (1397). بررسی تأثیر جهت حرکت وسیله نقلیه بر ایمنی عابر پیاده در تقاطع‌های شهری. پژوهشنامه حمل و نقل, 15(4), 299-308. مصطفی شفاعتی; امین میرزا بروجردیان. "بررسی تأثیر جهت حرکت وسیله نقلیه بر ایمنی عابر پیاده در تقاطع‌های شهری". پژوهشنامه حمل و نقل, 15, 4, 1397, 299-308. شفاعتی, مصطفی, بروجردیان, امین میرزا. (1397). 'بررسی تأثیر جهت حرکت وسیله نقلیه بر ایمنی عابر پیاده در تقاطع‌های شهری', پژوهشنامه حمل و نقل, 15(4), pp. 299-308. شفاعتی, مصطفی, بروجردیان, امین میرزا. بررسی تأثیر جهت حرکت وسیله نقلیه بر ایمنی عابر پیاده در تقاطع‌های شهری. 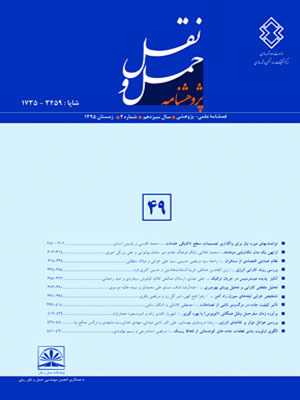 پژوهشنامه حمل و نقل, 1397; 15(4): 299-308. پایین بودن سطح ایمنی ترافیک، تبعات گسترده‌ اجتماعی و اقتصادی دارد و هم‌چنین مانعی برای توسعه‌ی پایدار محسوب می‌شود. ایمنی عابر پیاده از اساسی ترین موضوعات مطالعات ایمنی محسوب می شود. تقاطعات بدون چراغ به دلیل آن که فاقد کنترل کننده های ترافیکی مانند چراغ راهنمای عابر و وسیله هستند و در آن ها تعداد برخوردهای ترافیکی بیشتری بین عابر و وسیله رخ می دهد، از محل هایی هستند که ایمنی عابر در آن ها به خطر می افتد. تا کنون متغیرهای مختلفی که بر شدت تداخل تأثیر گذار هستند، شناسایی شده است اما بیشتر آنها در تقاطع های چراغدار و در نوع خاصی از حرکت مثلا حرکت راستگرد یا چپ گرد مورد ارزیابی قرار گرفته اند. در این تحقیق، تأثیر نوع حرکت وسیله نقلیه (چپ گرد، راستگرد، مستقیم) بر ایمنی عابران پیاده با استفاده از شاخص های تداخلی در تقاطع های بدون چراغ، تحلیل می شود. داده های مورد استفاده در این تحقیق با استفاده از روش پردازش تصاویر بدست آمده‌اند. تأثیر نوع حرکت بر شاخص های تداخلی زمان تا تصادف، فاصله زمانی و زمان پس از تخطی با استفاده از تحلیل آنووای یک طرفه انجام شد. تقاطع مورد بررسی در این تحقیق، در محل تقاطع خیابان وصال شیرازی (خیابان اصلی) به خیابان بزرگمهر (خیابان فرعی) است. در نهایت پس از انجام تحلیل­ها مشخص شد نوع حرکت وسیله نقلیه در قابلیت اعتماد 95 درصد تنها در شاخص زمان پس از تخطی تأثیر داشت. اختلاف معنادار، بین حرکت­های راستگرد و مستقیم ملاحظه شد، این اختلاف برای لگاریتم شاخص زمان پس از تخطی 08/0 بود. در واقع این شاخص برای حرکت مستقیم نسبت به راستگرد به این میزان کمتر بود. علت این موضوع بیشتر بودن سرعت وسایل نقلیه در حرکات مستقیم نسبت به بقیه حرکت ها و ارتباط معکوس سرعت وسیله نقلیه با شاخص زمان پس از تخطی بود. The low level of safety of transportation causes expanding social and economic consequences. It's also an obstacle to sustainable development. The pedestrian safety is one of the most important issues in the safety of transportation. Non-signalized intersections are one of the places in which there is too much risk for pedestrians because there are rarely any control equipment for pedestrians and vehicles movements. Therefore many conflicts between these two parties occur at such a place. Many effective variables on the intensity of conflicts have been identified, but many of them have been analyzed in signalized intersections and special types of movements like left-turn or right-turn. In this research, the effects of the type of movements (left-turn, right-turn or straight) on pedestrian safety at non-signalized intersections are analyzed using surrogate safety measures. The data have been obtained, using the image processing method. The effects of types of movement on Time to Collision (TTC), Gap Time (GT) and the Post Encroachment Time (PET) have been analyzed by one way ANOVA. The intersection is called Vesal Shirazi-Bozorgmeg Street. Finally, after analysis, it was realized that the type of vehicle movement is significant in only PET in the 95 percent of reliability. The significant difference exists between straight and right-turn movements. This difference was around 0.08 for the logarithm of PET. This measure was smaller in straight movements in comparison with right-turn movements because the speed of vehicles which move straight was more than right-turn ones and there was an indirect relation between the vehicle speed and PET. - ‌حقانی، م.، شاه حسینی، ز.، (1390)، "برنامه‌ریزی حمل و نقل و مهندسی ترافیک به همراه مروری بر آمار و احتمالات، انتشارات آوا. -‌Aliaksei Laureshyn, Ase Svensson, Christer Hyden. (2010), “Evaluation of traffic safety, based on micro-level behavioral data: Theoretical framework and first implementation”. Accident Analysis and Prevention, 42, pp.1637-1646. -Darcin Akin and Virginia P. Sisiopiku. (2007), “Modeling interactions between pedestrians and turning-vehicles at signalized crosswalks operating under combined pedestrian-vehicle interval”. -Greenwald, M., & Boarnet, M. 1112, (2016), “built environment as determinant of walking behavior: Analyzing nonworking pedestrian travel in Portland, Oregon”. Transportation Research Record: Journal of the Transportation Research Board, 2481, pp.33-72. -Lord, D., (1996), “Analysis of pedestrian conflicts with left-turning traffic. Transportation Research Record: Journal of the Transportation Research Board. -‌One Way ANOVA in SPSS Statistics-://statistics.laerd.com/spss-tutorials/one-way-anova-using-spss-statistics.php. - Piotr Olszewski, Ilona Buttler, Witold Czajewski, Pawel Dabkowski, Cezary Kraskiewicz, Piotr Szagala and Anna Zielinska. (2016), "Pedestrian safety assessment with video analysis", 6th Transport Research Arena April, pp.18-21. -Piotr Olszewski, Beata Osinska, Przemyslaw Skocynski, Anna Zielinska, (2016), “Review of current study methods for VRU safety, chapter 3”. Project No. 635895_ lnDev, HORIZON 2020- the Framework Programme for Research and Innovation. -Saulino G., Persaud, B., and Bassani, M., (2015), “Calibration and application of crash prediction models for safety assessment of roundabouts based on simulated conflicts”. Washington, DC: Transportation Research Board 94th annual meeting (No. 15-4968). -"Submitted for presentation and publication at 86th Annual Meeting of Transportation Research Board‌, (2007), 21-27 January, Washington, D.C.
-‌Ultich Sander, (2017)‌, ‌"‌Opportunities and limitations for intersection collision intervention- A study of real world left turn across path accidents" Accident Analysis and Prevention, 99, pp.342-355. -WHO, )2017(, " Global status report on road safety: supporting a decade of action." Report. -‌Wei, Cheng, Ning Zhang, Wei Li, and Jianfeng Xi., (2014), “Modeling and Application of Pedestrian Safety Conflict Index at Signalized Intersections: Discrete Dynamics in Nature and Society”, Vol. Article ID 314207, pp.6. self-reported behavior at signal-controlled crossings”. Transportation Research Part F: Traffic Psychology and Behaviour, 3. 2, pp.2-23. -‌Ying Ni, Menglong Wang, Jian Sun and Keping Li. (2016), “Evaluation of pedestrian safety at intersections: A theoretical framework based on pedestrian-vehicle interaction patterns”. Accident Analysis and Prevention, 96, pp.118-129.